Fair Winds Press, 9781592337217, 208pp. Bowl food. It's a hash tag. It's a buffet for one. It's a way of life. Simple and nourishing, vegan bowls are where it's at. Perfect for workday lunches, simple dinners, and even breakfast, these are meals so good you'll soon forget plates even exist. Bowl-tastic snacks (great for parties) and delectable desserts are included, too! Jackie Sobon is a food photographer, recipe developer, and author specializing in vegan food. She is the founder of the popular food blog Vegan Yack Attack, which has been showcasing her creative recipes and stunning photography since 2011 and has been placed on many top blog lists. Her work has been featured on websites such as KTLA News, ABC News (Good Morning America), VegNews, Kris Carr, PureWow, Babble, and BuzzFeed. Jackie has photographed cookbooks for the likes of Jason Wrobel, Happy Herbivore, and other plant-based authors. 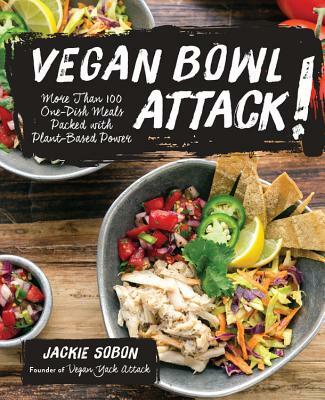 She is the author of Vegan Bowl Attack! and Vegan Yack Attack on the Go!. "The array of dishes can satisfy your every craving without consuming a bite of meat or dairy. And, BTW, you don't have to be vegan to enjoy them."